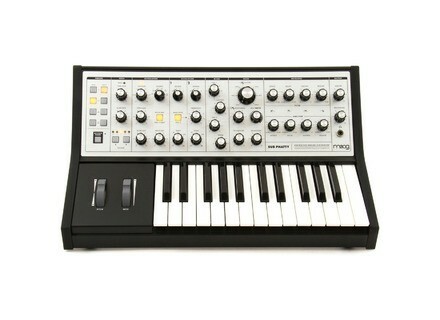 Sub Phatty, Analog Synth from Moog Music. 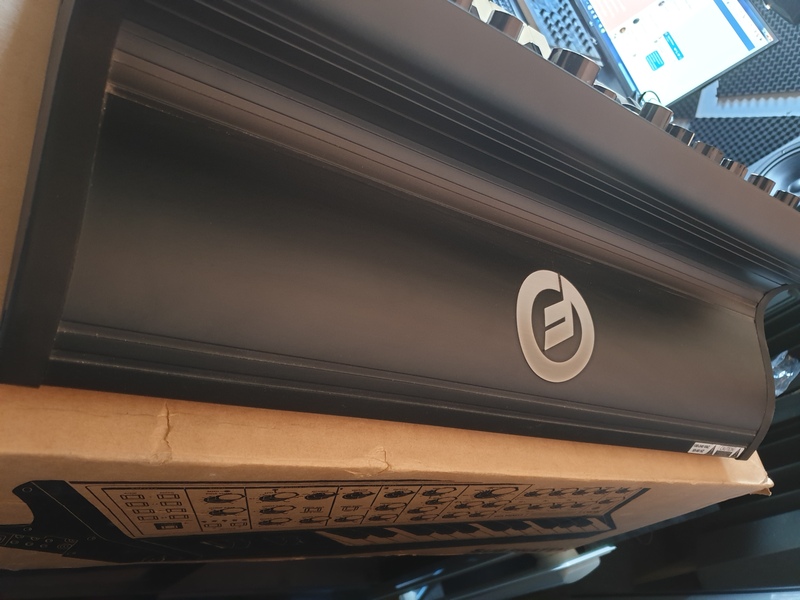 You can read the specs on the Moog site or here on AF. What's most important is that this synth is fully analog with memories and a PC editor that works pretty well (even though it's not the easiest to use in the beginning). The 25-key keyboard is not a big deal for me because I usually sequence using Live. If there were a rack version available I would've gotten that instead. As for the use of the synth itself, one control = one function, so it's super easy as long as you know something about subtractive synthesis. The hidden functions really allow you to modify the behavior in depth, but they aren't always very clear (the use of internal memories is indispensable without the editor). However, it was a real pain trying to get the editor to work as VST with Live. It seems to work perfectly fine on Mac with the USB, but on a PC you need to have USB + a midi in / out connector for it to really work. Once you've configured that, it's a delight, especially with Max4Live, which provides infinite modulation possibilities. Warn your neighbors! This was my first analog hardware synth and it's simple, it dwarfs every exiting emulation (except maybe for DIVA), especially when it comes to basses. It's simple I don't think it's possible to create such deep sounds. The multidrive allows you to create very aggressive and modern sounds, however you can also create creamy and sweet sounds without pushing it. It's a delight for all types of electronic music, as well as for Sound Design. Combined with the processing power of computers you can play nearly any type of synthetic sound very quickly. But, once again, where it shines brightest is with sounds that are heavy on lows. I've had it for 9 months and it was my first analog synth (a present for my 25th birthday) and I use it on every one of my songs. It's expensive, but when it comes to music and audio, if you want the best tools you need to pay the asking price. No effects (you'll need a delay, reverb and others for dub, for example). 16 presets that can be overwritten to save your own presets in the internal memory (that's for me ONE OF THE MAIN STRENGTHS, because it's pretty rare in the analog world). Playing 3 keyboards live, I don't see me recovering the exact settings or patching them on the spot!! No sustain on the cues, but for $20 you can get a basic ROLAND pedal. Careful it's MONOPHONIC...so you can't make any chords (but playing with the frequencies you can obtain and save set intervals: Thirds, fourths, fifths...). First analog for me, it's easy enough to understand how it works...what takes longer is testing all possible combinations you can do with it. The manual is an easy read. It's well done, there are examples to illustrate each part of the synth so you can see in real time what happens. EDITING is über-easy, as easy and fast as on a NORD. I added the sub phatty (for its heavy dub aspect) to a NORD ELECTRO 4D and a KORG PA 3X to make reggae roots with a touch of DUB. And I'm very satisfied with this backline, which allows me to cover all my needs. It makes no sense to talk about realism with an analog synth because it's not intended to "emulate and acoustic instrument." That's not the goal! You get your money's worth in terms of sound quality...the MOOG sound. Moog's website is a better place to look up the technical features. No external PSU, a good point! And, even if it's something very personal, I think it looks very nice. The one function - one control philosophy is very practical and makes the Sub Phatty easily controllable and intuitive. Especially as the pots in question seem to be of excellent quality and feel very nice. They are precise, "soft," regular, well-calibrated. There are hidden functions that you need to learn by heart. They are also accessible via the plug-in editor, which works fine. Speaking of the (VST/AU) editor, I think it's well-made and effective. The plug-in allows you to save the presets, which can save you a lot of time. Nevertheless, it sometimes interferes with Logic Pro X's MIDI control, which can result in surprises. Consider adjusting the settings in the DAW. The keyboard seems solid, it's velocity sensitive, without aftertouch. The shell (metal for the most part) and the connectors (metal and plastic) give a solid impression. The Moog know-how is obvious. The sounds suit me fine. It can sound fat for basses or be really acid and make itself heard in the mid/high ranges. The envelopes and filters are fast, which allows you to make percussive sounds. The sub does its job well and reinforces the low end of the spectrum. The possibilities are pretty wide and aren't limited to the basses and sub. This synth loves to roar under the effect of HardSync/Resonance/Multidrive…it's fantastic! Looking for a sound is a real treat with this synth, and you can expect some surprises...It has potential, that's unquestionable. I modified my review after six months of use. I said I was a bit disappointed, but that's not the case anymore. This synth is definitely as fun as can be, it has a powerful sound and fits my songs perfectly, in all registers (lows, mids, highs). I'm not disappointed anymore, I've become a fan now after having used it more. It has no built-in effects. I bought it for $1100, and I would buy it again. What I like most is its "efficacy," you plug-in, play, you have (almost) all controls at your hand. Immediate, direct, physical access. No menus and sub-menus...And it sounds fine! What I like the least is the integration with the computer world, it's OK but it can be perfected. The limited saving of presets without a computer. No screen. 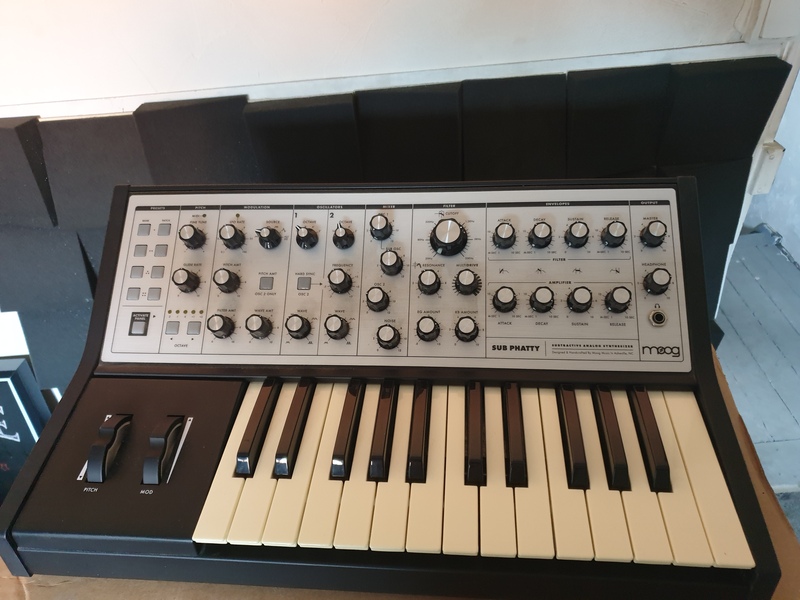 nofuturenocore's review (This content has been automatically translated from French)" Moog"
Very easy to use for someone who already practice the synthesis. Manual in English, very clear, 30 minutes was go around and is ready to start. Editing sound is very pleasant thanks to the number of knobs that make this synth its main asset for its price. 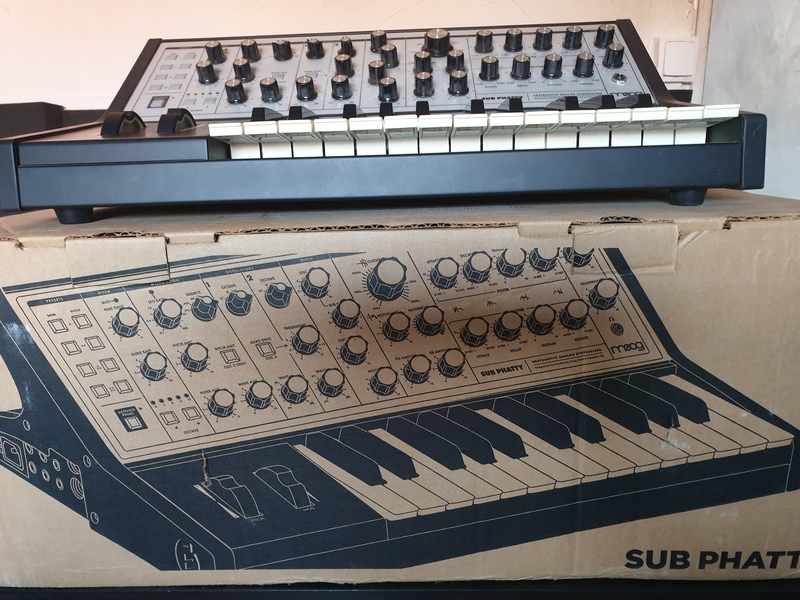 I can not compare the sound to anything because this is my first analog synth and a comparison operator or Massive would be an insult. Regarding the response of the keyboard it suits me, not knowing how to play the piano I will not comment on the point, but to my taste the quality of the keys is ample. The sounds of the VCO are very good, excellent stability of those above. The Multidrive brings a huge plus for people who want to have the Moog sound avecun small coterie Trashy more. By the resonance and multidrive thoroughly on a triangular wave roar beautiful effects obtained by playing with the filter cutoff. The envelope of the VCF and VCA slap very well for percussive sounds style. When the modulations are certainly limited, but it can still be a big variety of sounds, playing with the assignment of the LFO on Waveshape can get closer to the sound of FM synthesis. 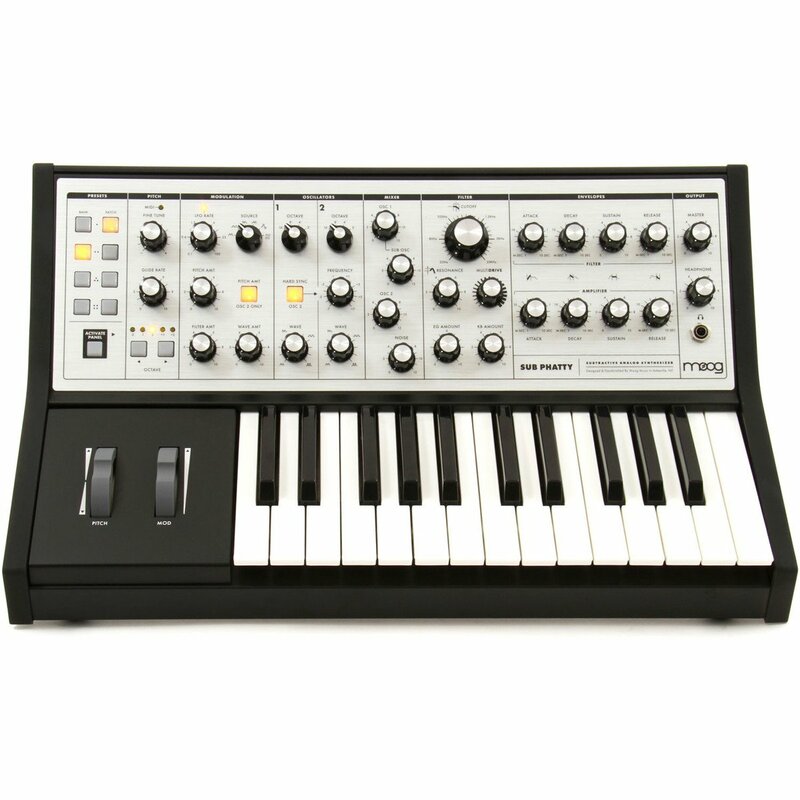 I bought this synth yesterday and I did not pick up. 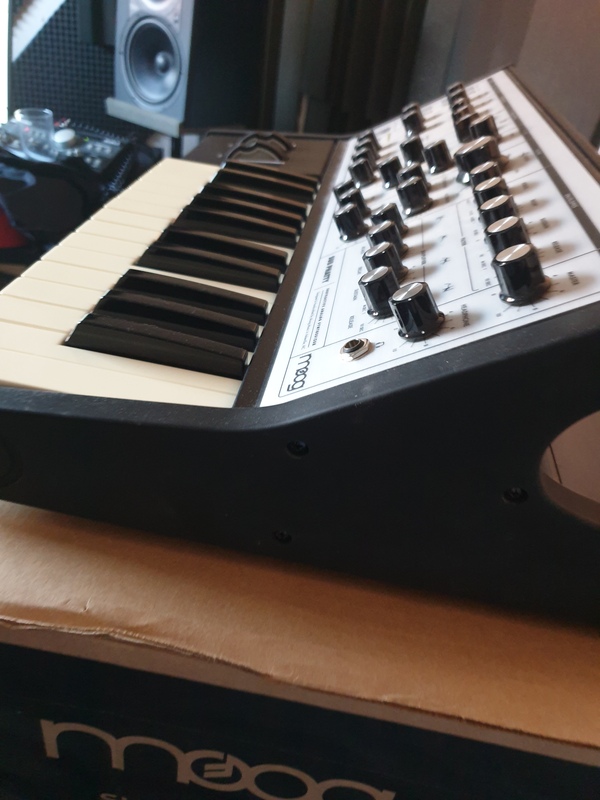 This is the first synth that I put my fingers so the comparison is impossible, but I am 100% satisfied. - An impeccable quality of workmanship. - A very good sound quality. - A number of knobs that can have fun without taking head. - The Moog filter coupled to Multidrive which allows for the Moog sound with a little more character. - Envelopes that good spanking for percussive sounds. If I had to say anything bad about this synth I can say 2 things, 16 presets is a bit light for people who play live piano (but apparently the app that will come in ten days it will be possible to replace quickly via computer), but personnaly do not mind me tremendously. And to my great surprise by opening the box I saw that the USB cable was not provided with .... Yes yes hard to say anything bad about this product that is in my opinion a very good investment. However, as said above this is my first synth so consider this. More Amos, seen on video Musikmesse meets the Moog forum has all your questions and is currently dévelloppé management program preset available in BETA on Mac only now (What I could not try because I'm on Windows 7). The final version should be available by June 15 on Mac and Windows. The Moog Sub Phatty was evidently on our NAMM 2013 must-see list, and the Moog team kindly welcomed us with for special presentation.